Miffed that you missed the tiny private viewing of Between (written by and starring Oskar Brown) in Hout Bay? Pissed that you couldn’t get to Edinburgh to see it at the festival? 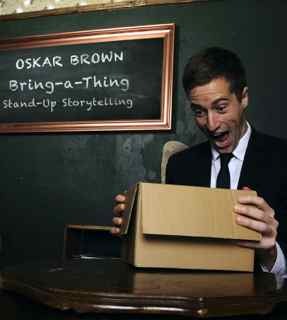 Oskar Brown in Bring-a-thing: Oskar Brown’s stand-up storytelling. Boys, girls, straights, gays and all those between should get themselves tickets for Between at the Edinburgh Festival. As part of a select group of people (I was there by virtue of having very good taste in friends) I saw this show at a private function in a spectacular home in Cape Town earlier this year. The show was a 40th birthday present (I told you: I might be totally unrefined but I am alone in this respect in my social set) and the crowd of nuclear scientists, concert pianists and a journalist numbered less than 20. You might think this auspicious event was quite a lot for two boys in their underpants to live up to: a select crowd gathers for an intimate showing in a wonderful setting. You need not have worried. The star of the show was absolutely, without a doubt, hands down [loud clapping] … the show itself. Between has since played in Brighton and is now heading to Edinburgh, and will surely wow them there. Get yourself a ticket, you won’t be sorry! Thinking of the Edinburgh Festival reminds me of my own visit there three years ago, when I scribbled the following blog posting (published on an another website which has since been laid to rest). Joan Mitchell at Inverleith House, at the top of Edinburgh’s Botanic Gardens. In the words of the brilliant Jackie Wullschlager, Financial Times art critic, this was the “best, most exhilarating, most affecting exhibition of paintings in Britain this summer ”. I was visiting a schoolfriend in Edinburgh (along with two other schoolfriends) a couple of decades after we had left our tight plaits and loose floral dresses behind in Pietermaritzburg. Everything seemed, at once, familiar and strange as the four of us who had been so close 20 years before explored the city and our emotions together. In amongst a few days wondering around gorgeous Edinburgh and seeing a few shows at the Fringe, we wandered through the gardens to the gallery at Inverleith House and were mesmerised by Joan Mitchell for hours. This was the highlight of a very lovely three days in this beautiful city. The gallery space is beautiful, with large windows flooding the rooms with light, while allowing one to stare out on to lush, bright gardens. Staring out of a window at the manicured, almost luminous gardens sometimes provided a counterpoint, almost a relief from the work, which focuses on landscape painted from memory. I think it was more about remembered emotions than remembered vistas. We stood, we sat and we lay down in front of the work … feeling, experiencing, dreaming. At least once I thought I could faintly hear the hissing of the heat and the energy passing through us, between us and the work, and between us and us. We stayed with the first painting for about an hour. We talked about it and sometimes we sat in silence working through and absorbing the collisions and contradictions. At first I saw lots of chaos, confusion and anger, quite confronting stuff. But after a while a playfulness emerged and I was reassured by the still, deep blues and purples in the beyond. That calm reverie stayed as I passed through the various rooms enjoying the light and the work. Then the last painting shocked me out of that by being absolutely and totally inaccessible to me. I could not ‘get in to it’ and felt like I was stuck outside a nightclub. That reminded me to keep coming back with more questions, rather than think I have the answers. I asked the curator if this was his intention in any way when he chose to hang that (unfathomable) picture last. He smiled a mischievous smile and said he was glad we had engaged with the work so physically and thoroughly, and gave us a poster for our efforts. It seemed appropriate to have spent so much time at this exhibition when I heard that the Edinburgh Festival was established in 1947 as a post-war effort to “provide a platform for the flowering of the human spirit”. 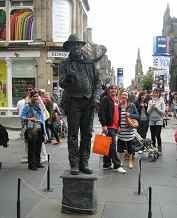 The Edinburgh Festival is a collective term for several arts and cultural festivals and events that run simultaneously during August each year in Scotland’s capital city. Collectively they make up the largest cultural event in the world. 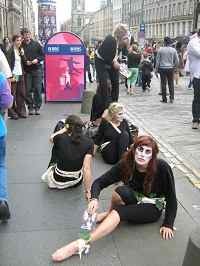 The Fringe attracts mostly events from the performing arts, particularly theatre and comedy, although dance and music also figure significantly. The Fringe is enormous and fantastically varied! I am not sure that you could ever be satisfied that the research you have done is enough, but my advice is Do As Much As You Can! Once you are there you will wish you had second and third choices as new shows catch your eye and make you change your plans and others are sold out. You can, of course, book things beforehand. We missed out on quite a few shows that caught our eye because they were sold out by the time we called the box office. We had booked a couple beforehand, but also left quite a bit of time unscheduled and followed our fancies a bit, which worked well for our group. There is an element of pot luck to the festival anyway as there is no selection committee to approve the entries. The Fringe often showcases experimental work. We saw a few ticketed shows, which were really enjoyable, but most of our entertainment came from walking through the town, gardens and market stalls, watching the many street performances along the Royal Mile, and just lapping up the vibe. ← Carpe diem! Carpe Langa!